Religious leaders and faith groups have called on the government to take action to tackle a “national crisis” of rising hunger and food poverty, as latest figures suggest more than a million Britons have been helped by food banks in the past year. More than 40 Anglican bishops and 600 church leaders have signed a letter, calling on David Cameron, Nick Clegg and Ed Miliband to tackle the causes of food poverty, including low wages, rising food prices and an inadequate welfare benefit safety net. The letter said the period running up to Easter had been a time of “sorrowful and deep reflection” for people of all faiths on what it calls the terrible rise in hunger in Britain, and urged society to “begin rising to the challenge of this national crisis”. The document, signed by 45 of the UK’s Anglican 59 bishops, including those from Durham, Southwark, Bath and Wells, St Albans, Coventry and Edinburgh, although not by the Archbishops of Canterbury or York – calls on the main parties to engage with and support the findings of a newly created all-party parliamentary inquiry into the causes of food poverty and hunger. The letter coincides with the release of data by the Trussell Trust, the UK’s biggest food bank network, which reveals that more than 900,000 people received food parcels in 2013-14, a 163% increase. It is the second time in two months that church leaders have courted political controversy by publicly urging ministers to take action on food poverty, and reflects widespread feeling among faith groups involved in poverty projects that the government has failed to grasp the extent of the hardship faced by low-income families. In February, 27 bishops wrote to the Daily Mirror saying that Cameron had a moral duty to act on the growing number going hungry. The Trussell Trust said its figures represented “just the tip of the iceberg” of food poverty and demonstrated that many British citizens on low incomes, especially those reliant on benefits, were finding it harder to make ends meet. 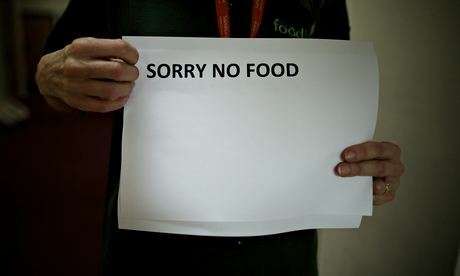 Over half of its food parcels went to people facing welfare cuts or delays in benefit payments, it said, in a direct challenge to ministers who have steadfastly refused to accept that there is any link between cuts to social security and the explosion in food bank use. The Trussell figures showed 913,138 people – including 330,205 children – were the beneficiaries of its food parcels in 2013-14, up from 346,992 in 2012-13. The main reason people came to the food banks for help was as a result of people being left impoverished by welfare changes, cuts and delays, it said. Its figures understated the likely level of people going hungry, it added, because they did not include thousands of people helped by non-Trussell food banks and soup kitchens, those who had no access to a food bank, those too ashamed to turn to charity food, or those who were coping by going without food or buying less. A separate survey of 130 Trussell food banks found that 83% reported that “sanctioning” – when job centres stop benefit payments to claimants for at least a month as a punishment for breaches of benefit conditions such a missing a job interview – was causing rising numbers to turn to charity food. Trussell, a Christian charity, currently oversees 404 food banks. Other drivers of food bank demand were incomes failing to keep pace with rising living costs, low pay, and under-employment. Trussell said in addition to providing food parcels it was also providing essentials like washing powder, nappies and hygiene products to struggling families. Other signatories to the bishops’ letter, organised by the End Hunger Fast campaign, include representatives of all the main Christian denominations, including Catholics, Methodists, Baptists, and Quakers, as well as groupings such as the Evangelical Alliance. There are no Muslim signatories to the letter but a number of mosque and community-based faith projects are now active providing food aid. A separate letter signed by 33 Jewish religious leaders calling on the prime minister to take action to ensure that no UK families go hungry will be published on Thursday tomorrow. Rabbi Laura Janner-Klausner, senior rabbi to the Movement for Reform Judaism, said synagogues and Jewish welfare organisations were seeing first-hand evidence of food poverty. This entry was posted in Uncategorized and tagged benefit delays, benefits sanctions, dwp, food banks, food poverty, Religious Leaders, Trussell trust. Bookmark the permalink.